They say that dogs smell fear. I knew that if the same was true of Cape buffalo, I was in very serious trouble. Just metres away stood one of Africa’s most deadly animals, his malefic eyes glaring beneath a boss of mighty horns, their sharp tips glinting in the sun. He angrily shook his head and snorted, before stamping a thunderous hoof onto the parched ground. “Don’t move,” hissed Mark, my Zimbabwean guide. His instruction may have been useful if I was not already paralyzed with the fear that sends dogs into the paroxysms of glee usually reserved for lottery winners. The buffalo shuffled his Fiat 500-sized blackness, moisture spraying from his nostrils. I stood slightly hunched, my mouth ajar. Flies mocked my involuntary inertia by gyrating unmolested around my nose and mouth to the resounding beat of my pounding heart. An African walking safari had seemed like a good idea from the safety of my home. I had visions of myself in pith helmet and jodhpurs, sipping gin and tonics while a coterie of porters carried my elegant trunks…and perhaps me, if I indulged in too much gin. But now, about to be pulped into buffalo mulch, I wasn’t so sure. There’s four-wheel drive, overland truck, balloon, ultra-light, helicopter, airplane, canoe, kayak, houseboat, pontoon boat, even bicycle, horseback and elephant back…but for that old-fashioned derring-do dance with death, nothing beats that most ecologically friendly of adrenaline sports: a good walking safari. I had been lured to my feet by the sheer romance of trekking in the bush. This was the style that had conveyed Stanley and Livingstone from the Swahili coast to the source of the Nile and beyond. Separated from big game by nothing more than flies and heat shimmers, I would be completely dependent on the knowledge, experience—and as a last resort, the rifle—of a safari guide. I knew it wouldn’t yield the best close-up wildlife photos, but I was looking forward to insects, birdlife, the art of tracking and perhaps a touch of blood-curdling adventure. Or so I thought. Our author getting up close and personal to the action! I packed my hiking boots and everything khaki and beige in my wardrobe and headed to Matabeleland, Zimbabwe. The plan was to spend three nights in the bush, cooking over an open fire and sleeping in basic thatched shelters along the way. 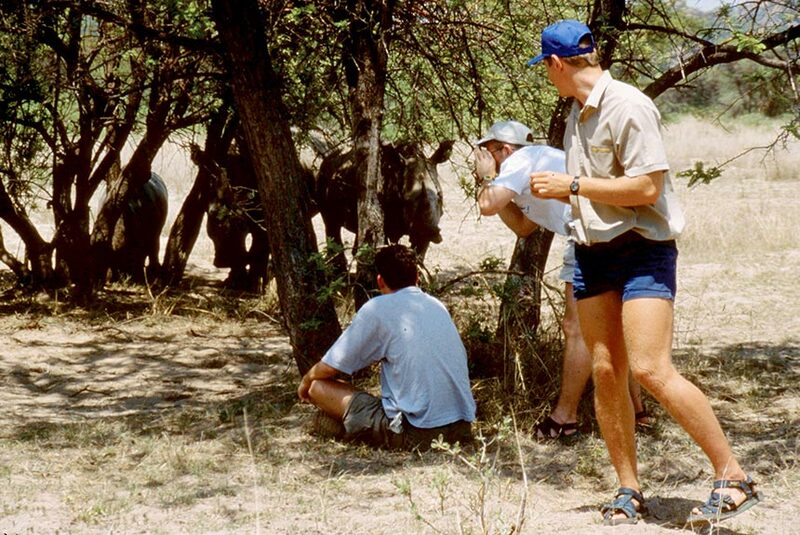 Although walking safaris are usually limited to small, manageable groups, Mark explained that I was the only guest. 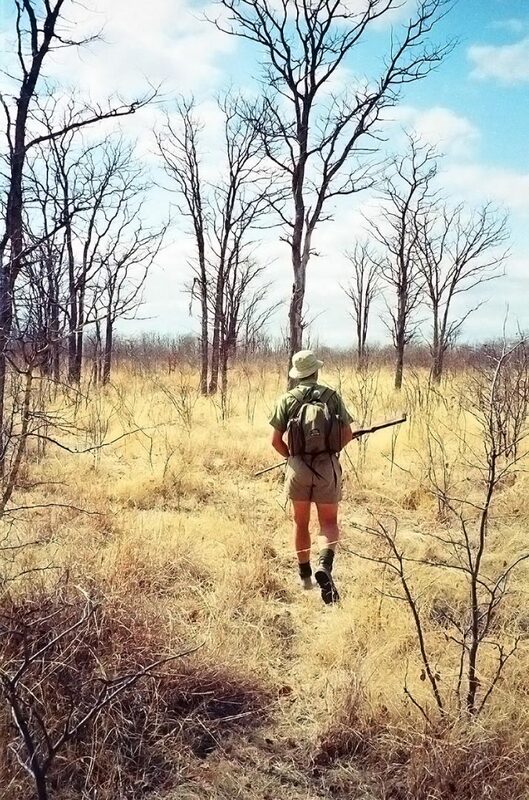 As I followed him away from the airstrip I wondered if it was smart to spend three days alone with a man who spent most of his time in the bush, carried a rifle and was wearing very, very short-shorts. We followed the tarmac road before heading down a barely discernible dirt track that weaved through a private ranch bordering Hwange National Park. “Right,” Mark began, while removing his rifle from a lock box in his Land Cruiser. “We stay quiet at all times. Stick right behind me. If I say stop, you stop. You do exactly as I say and never, ever run. Got it?” I nodded yes, although the reality of trekking in the bush suddenly had me longing for my porters and gin. We were soon wading through an endless sea of swaying sepia grass. Mark moved quietly and confidently, eyeing the ground and the bush around us. He was constantly alert for things to share and things to avoid. He crouched and pointed to a faint track in the powdery sand. When you’re on a walking safari, you need to look the part. “Elephant. A young female. See here,” he said, gesturing to a slight buildup of sand beyond the almost perfectly round imprint. “She was going in that direction, likely last night.” I was eating this stuff up. I felt like I had been transported to one of those TV shows or an old Tarzan film. At midday we stopped in the shade. It was the dry season of an epic drought, and we descended into a dry riverbed and started a hard slog in the soft sand. The banks of the river arched over our heads. My Hemingway-esque bravado drained into the sand and I wondered what had ever possessed me to swap the comfort and safety of a lodge and vehicle for a character-building experience. After all, what was the point of character if you were leopard nibbles? That evening we sat around the campfire and listened to the sounds of the bush and an almost imperceptible drumming from a distant village. I asked Mark what some of his most exciting safaris had been, and immediately regretted it as he regaled me with tales of lions and elephant, hippos and buffalo—and unfortunate tourists. 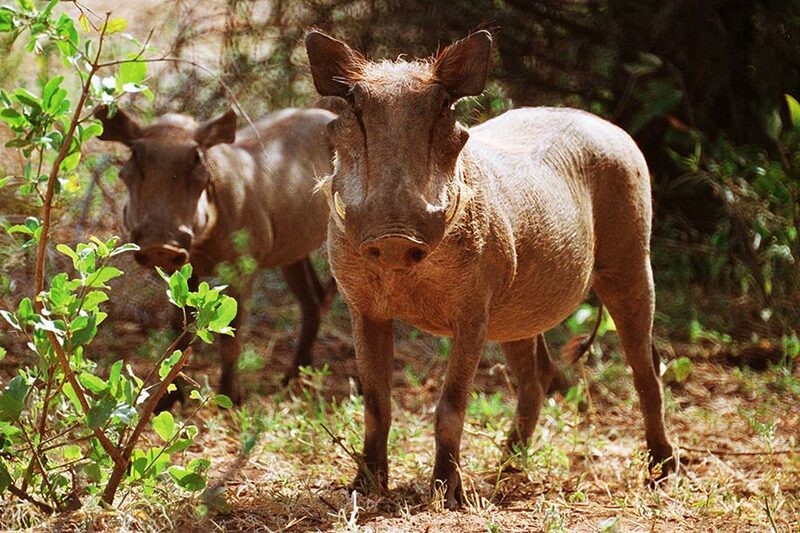 Spotting a family of warthogs. He gripped his rifle tightly. “Stay close to me and do exactly as I say. More people are killed by buffalo in Africa than by anything else,” he whispered in an effort to comfort me. A few minutes later a huge black rump charged across the trail. Mark turned and smiled, but instead of returning the way we’d come, he forged onward toward the ebony leviathan. There are times when curling up, sucking your thumb and rocking gently aren’t merely pleasant, but actually advisable. I would have swapped my silly hat for a bowl of puréed apple and an afternoon nap right about now, but instead, I had death to defy. The best options for walking safaris are usually found in southern Africa (South Africa, Botswana, Zimbabwe and Zambia), although there are also opportunities in Kenya, Tanzania and Uganda. Most national parks and reserves don’t allow walking safaris so check before you arrive to see if walks are available, or opt for a private game reserve. Aim for the shoulder season to avoid the intense heat of the dry season and the mud and wet of the rainy season. If you fancy a shorter walking safari, many lodges offer guided walks lasting a few hours as an alternative to a multi-day trek. If photography is your thing, try to only take one multi-purpose zoom lens for both long shots and macro close-ups without the burden of carrying a ton of gear. Simon Vaughan is Senior Editor & Special Travel Advisor for Outpost Travel Media. He’s a longtime travel-industry insider who’s worked at some of the best travel companies in the world, and writes regularly for Outpost.